Starting at the western end, Halswell Junction Road used to be a notoriously grotty road to bike on, with bugger-all shoulder to play with on a busy 70km/h route. In some ways, things have now improved, with good no-parking shoulders to ride on and an off-road path on one side. 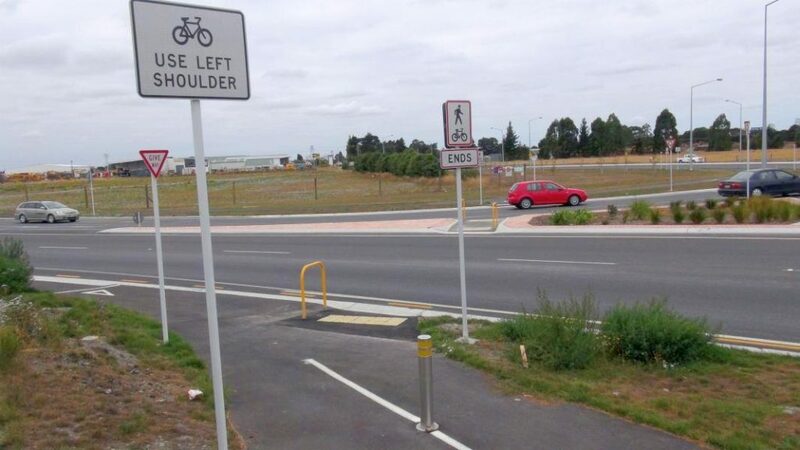 What ruins it is the total lack of on-road facilities at the new Shands Rd signalised intersection and a pretty shoddy ride along the pathway up and down driveways and across ridiculously wide side-roads. 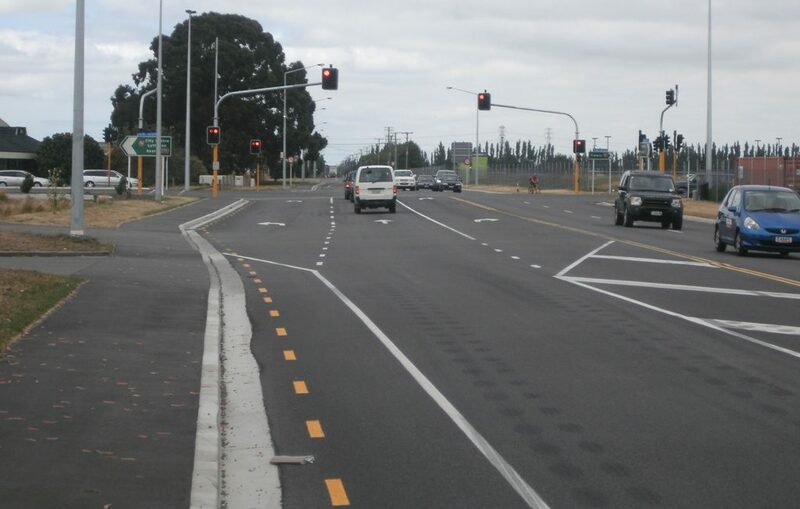 Shands Rd / Halswell Jn Rd: How does a brand new intersection get built in this day and age without cycling facilities? On to Springs Rd roundabout: the enlarged roundabout includes pathways all around the periphery, but they are potentially a tricky way to cross if you have two lanes of rush-hour traffic approaching you. 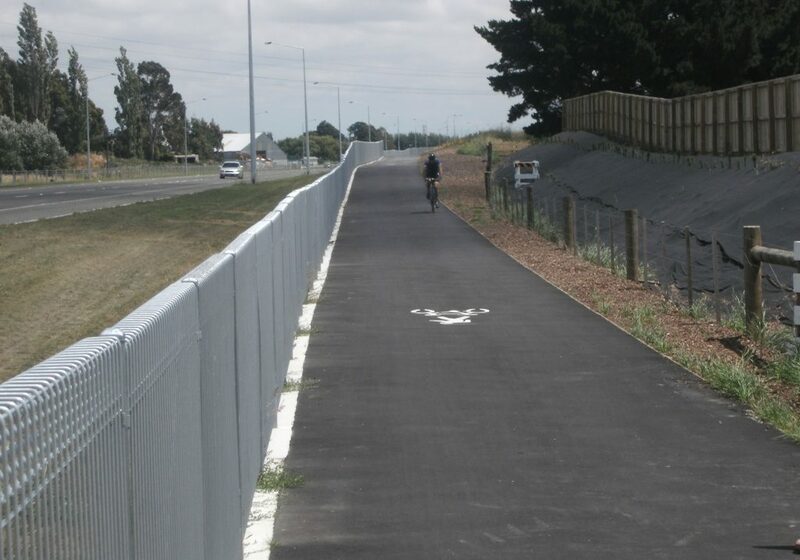 At the two road overbridges (Awatea/Dunbars Rds and Aidanfield Dr) side paths connect you to the roadway. 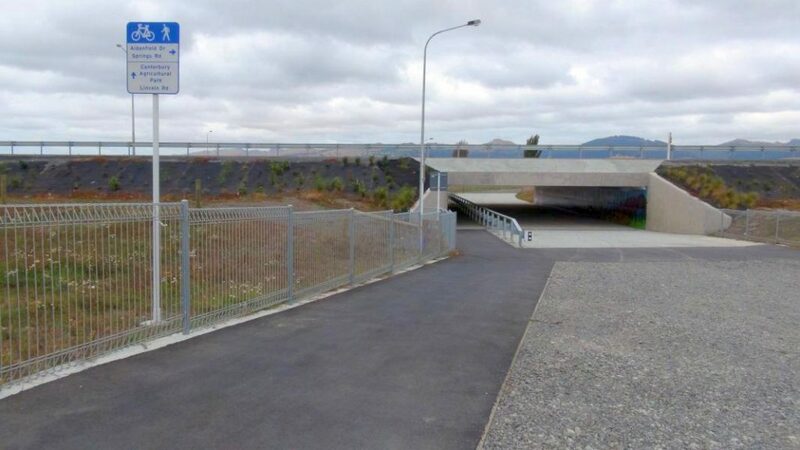 There’s also a connection to Carrs Rd (a handy way to access Wigram Skies) and in the future a pedestrian/cycle overbridge will span the motorway here. An underpass provides a (currently undeveloped) link to Aidanfield (near Somerville Cres), however they missed a trick in not providing a direct link into the Broken Run subdivision. Behind this fence is another pathway in Broken Run! 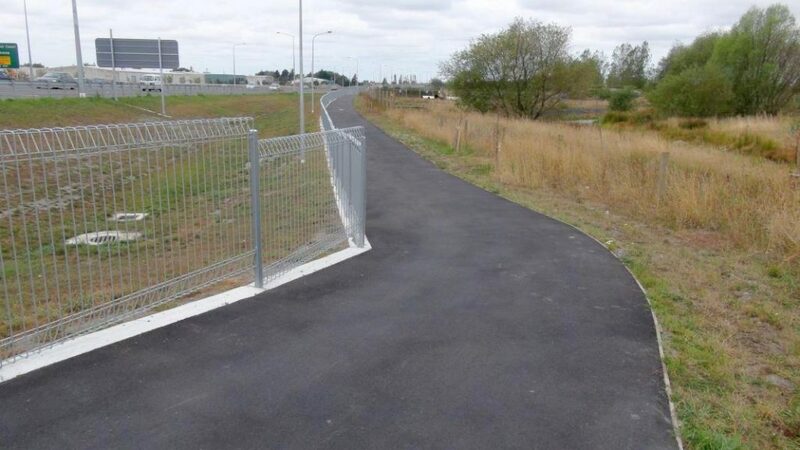 Approaching Wigram Rd, the pathway reaches the A&P Showgrounds underpass. 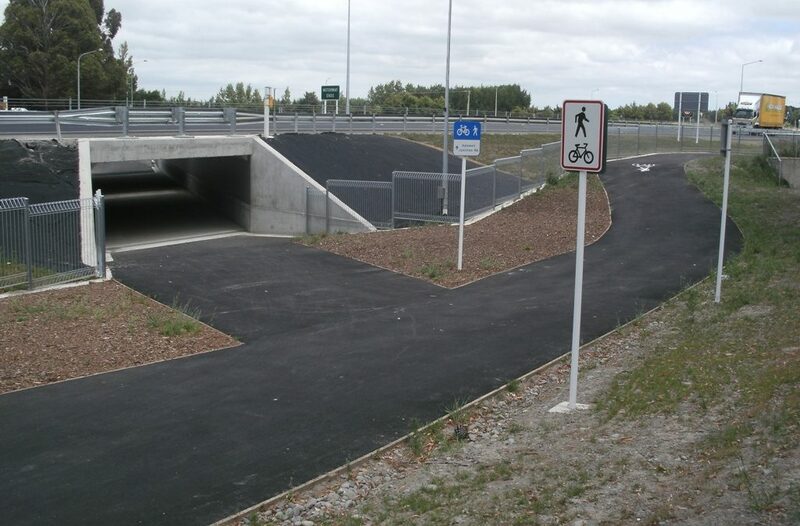 Here riders face the choice of either turning left onto Wigram Rd, or right, through the underpass and then along the pathway that leads around Curletts Rd to Lincoln/Halswell Rd. 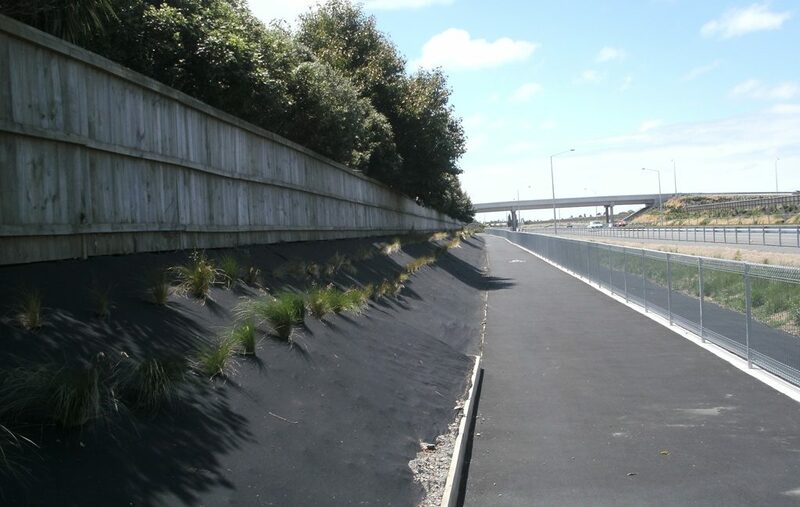 What do you think of the new Motorway pathway? It looks good, apart from the missing path where it says to follow the shoulder, but how’s the noise from the motorway? Generally I didn’t find the noise too bad; that extra 5-10m from the roadway helped minimise the noise impact. 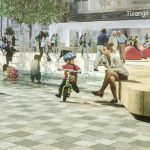 It’s even better alongside the raised sections at the eastern end, where the embankment and solid barriers keep the noise down a lot (and probably more once some planting comes through. The on-road stuff looks pretty shoddy but the off-road path looks amazing! Hope to ride it one day. 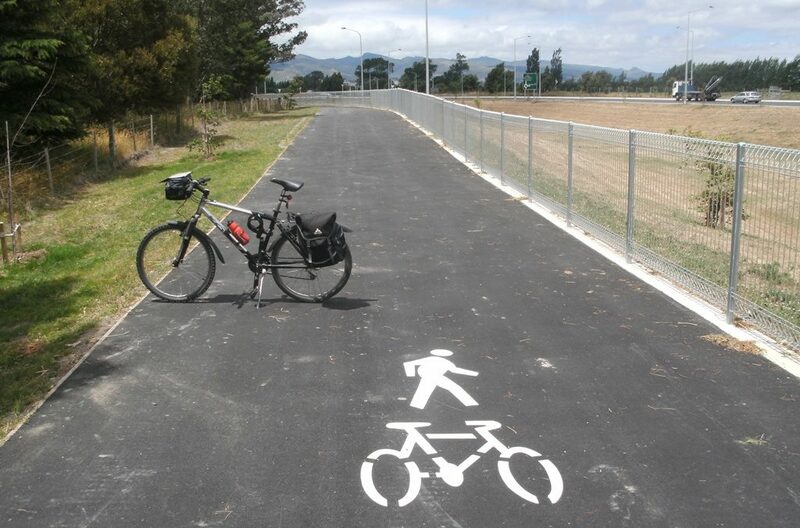 I have had look at these new paths and some of them actually remind me of cycle paths in Holland. While there might be room for improvements I think it is definitely progress!!! Thanks for posting Lenny. Rode this with the family a couple of months ago and very impressed with the off-road bit. I now use it for walking in the weekends. Well lit, secure and a pleasure to use. Also love seeing young families out using it for recreational biking!! I checked it out the other day after reading this. Yes the off road section is very good but….. I did not enjoy the Hornby end at all on the footpath and it seems to go nowhere in particular – just to roads with lots of unpleasant heavy traffic. And the Curletts road end is very inconvenient. If you want to go to Lincoln road – that is great. 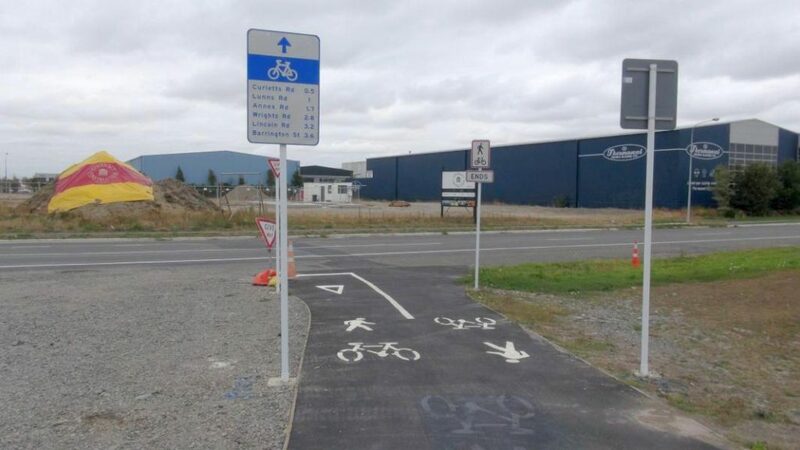 But if you want to go to Riccarton then you are directed on to a busy Wigram road with trucks rolling past before entering a path again along Curletts road. However if you want to carry on towards town then forget it. 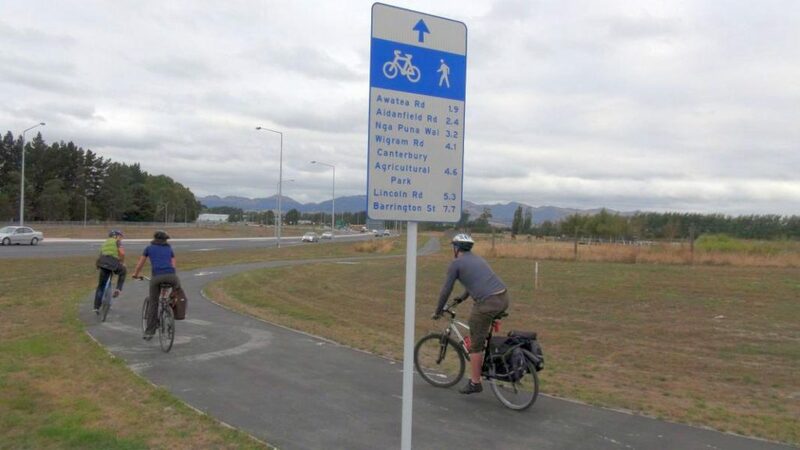 You would have to go out to Lincoln road, travel down it a bit then into Annex road and back to the under pass to meet with the bike path again – very inconvenient indeed. So my take on it is that it is a great start but each end needs follow up to make it useful.